Of course there's text on this print. I seem to be constitutionally incapable of making a print with no writing on it. I briefly considered carving all these words, but my shoulder and arm are hurting from working on the computer during last month's big commercial job fest, so I decided I couldn't face carving another block of text. I decided to hand letter instead, which is only slightly less taxing on my hand, but less taxing nonetheless. I bought a couple of brown chisel-tipped archival Prismacolor markers and set about doing it. These are native American place names that are still in use today. I made sure to include names from every state in the U.S. There are over 200 names and I'm lettering them by hand on every print (I expect an edition of 7). You can really see the funky blotchy edges that are created by printing moku hanga with stencils in these closeup photos. I don't mind them, though. It's good for me, a perfectionist, to allow some roughness into my work. And I think that the roughness works with this topic. So I decided I wanted the background of this American rivers print to look western, maybe vaguely like a Pendleton blanket. I chose some almost-garish earth tones (Pendleton uses some pretty wild colors) and used a series of masks and stencils that I cut from acetate. Here's a closeup of the first mask held in place with some artist's tape. In this case, I pulled back the acetate, inked the block with orange, pulled the masks back onto the block, laid down the paper and printed. I did this with two more colors, a green and then a light blue that created a darker green. These photos were taken at night, so they aren't very good, but you get the idea. Printing a woodblock with stencils and masks gives you a funky edge -- blotchy if you ink and then mask, and feathery if you ink through a stencil. But it's one way to work from a single block without cutting into it. Next I'll be carving some words. The Sunderland Public Library in Sunderland MA has a program they call "On the Same Page," which is a community-wide book reading and discussion series that also includes some author talks from time to time. The book they've been reading lately is Nathaniel Philbrick's Mayflower, a book that I referenced a great deal in my background reading for We Are Pilgrims. I was delighted when the library invited me to come and speak about how the book influenced my series of prints. If you're in the area, please join me! After about a month of work, I've finished the large commercial projects I had on my desk and have spent the past couple of days getting back into the new print I had started in February. First I printed the "rivers" block in a light blue. Remember the knots that were in the board? Happily, I didn't have any problems printing because of them. But it turns out that McClain's found so many knots in their last batch of shina that they've run out of large boards and won't have a new shipment until next month. So I guess my decision to make this print using just one board was the only choice I really had! Next, since I'm using just one block, I needed to get rid of the rivers so I carved them away. Then I printed a yellowish brown tone on the background. The Drachen Foundation sent this photo of the "Blessings Kite" print I sent them for their moku hanga kite competition, now beautifully sparred by kite artist Scott Skinner (check out his great web site, including his collaboration with artist Leslie Dill). All the kites are now on their way to Kyoto, Japan, where they will be shown at the 6th KIWA Exhibition March 29 - April 3 and then at the Mokuhanga Conference, June 7 - 12. It feels so good to be able to send my blessings to Japan in the form of a kite right now. Ganbare Japan! So many people have been asking me if I've canceled my trip to Japan in June for the Mokuhanga Conference. No! Absolutely not. I am SO going to Japan in June. First of all, the conference is in Kyoto, which is roughly 500 miles from the epicenter of the earthquake and maybe 450 miles from the Fukushima nuclear plant. Everything is fine in Kyoto. And yes, I'm going to go to Tokyo first to meet my friend Mariko, who I will then be traveling to Kyoto with. And yes, Tokyo is much closer to all the earthquake and nuke plant action. But although that's the case, everything is OK in Tokyo, too. I'll be keeping track of the situation, of course, but I'm going to Japan. Which brings me to David Bull, an extraordinary ex-pat Canadian ukiyo-e printmaker who lives in the greater Tokyo area. That's his work at the top of this page, one of my favorite pieces. Dave has written a beautiful and thoughtful piece about the situation in Japan from his perspective that I was really happy to read this morning. Thanks for posting your thoughts, Dave. I can't wait to go to Japan. I can't wait to meet my moku hanga colleagues from all over the world, to share our love of the art, to meet papermakers and tool makers and to convert my American dollars into yen and spend them with wild abandon. I can't wait to see my Japanese friends and let them know, just by peering into their faces, that I love them and that I wish their beautiful country well with all my heart. I'm so lucky to be able to make this trip and wild horses couldn't drag me away! Please don't worry. 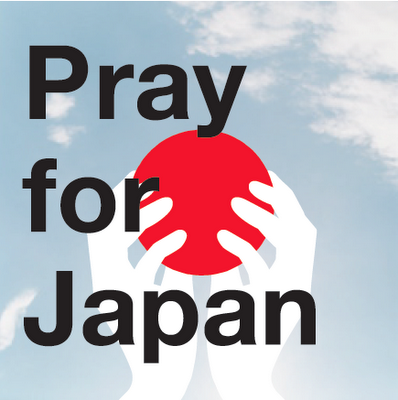 Ever since I woke up on Friday morning to the news of the earthquake and tsunami in Japan I've been glued to the internet, especially my Twitter account where the phrase #PrayForJapan has become ubiquitous. I can't stop thinking about the situation there and my heart breaks to see the images of the devastation in Tohoku, the northern part of Japan. Lynn and I visited Tohoku in 2004, and I thought it would be fitting to share some photographs of beautiful rural northern Japan with you. Enjoy, and please take a moment with me to send your good will to the people of Japan. I've posted some links above if you'd like to send some financial aid as well. Shiogama Jinja, a Shinto shrine for fishermen on a coastal cliff about 8 miles north of Sendai. Lynn and a papier mache effigy of the great haiku poet Basho in the harbor at Matsushima Bay, about 18 miles from Sendai. Boats in Taro, a fishing village which is part of the devastated town of Miyako. Taro had previously suffered tsunami in 1611, 1896, and 1933. When we were there we saw huge seawalls that had been built to protect the area. I doubt that Taro's seawalls were able to hold back this tsunami. You can see a YouTube video of the tsunami climbing the sea walls and overtaking Miyako here. The beautiful rugged coast of the Taro Village area. I'm happy to report that this print, God Blesses John Alexander and Thomas Roberts 1637, has been selected for inclusion in The Print Center's 85th Annual International Competition: Printmaking, which opens Saturday, June 4, at the Print Center in Philadelphia. Curated by Emi Eu, Director of Singapore Tyler Print Institute, and Sarah Suzuki, Assistant Curator of Prints and Illustrated Books at Museum of Modern Art in NY, the show will hang at the Print Center from June 4 – July 30, 2011, and then move on to Long Beach Island Foundation of the Arts & Sciences (LBIF) in Loveladies, NJ, for September 9 – November 1, 2011. I'm not so happy to report that I won't be able to attend the opening because I'll be in Japan for the 1st International Mokuhanga Conference. It's an embarrassment of riches, I know, but I would love to see the Print Center and meet the curators and some of the other artists in the show. Many thanks to The Print Center and the two jurors for selecting my work. I'm on a tear in my studio, but it's not woodblock. Got two massive commercial jobs going on, so my "river carving" is sitting in the corner taunting me. But here's a little something you might be interested in -- a new printmaking blog called The Wandering Printmaker. Blog author John Pyper, who is also a contributor on the Printeresting blog, reviews print shows, posts calls for entry and generally geeks out on prints. Check him out.